Moisture Barrier – Moisture barriers (like Tyvek, for example) are properly installed on the exterior of a frame wall, directly on top of the sheathing, and under the finished exterior surface. Moisture barriers help prevent bulk water from entering the wall cavity while still allowing water vapor to diffuse through. This is probably NOT a good place to install a vapor barrier… it is not properly sealed, and may promote condensation of water vapor inside the wall cavity. Vapor Barrier – Vapor barriers, typically a polyethylene plastic sheeting, are installed on the inside of a frame wall between the studs and the drywall. Vapor barriers help prevent water vapor from the interior of the house filtering through the wall and condensing on the warm side of the insulation. Wet insulation is a no-no. Vapor barriers are also installed under basement slabs to prevent water and ground gasses (such as radon) from making their way through the concrete. The point of having a moisture barrier like Tyvek housewrap outside the sheathing and the polyethylene vapor barrier inside the insulation is that in the event of condensation or infiltration of vapor into the wall system, the housewrap allows moisture to escape to the outside. Housewrap will also reduce the infiltration of water and water vapor into the wall system from the exterior, minimizing the potential for water to condense at the vapor barrier. In order to be effective, both moisture barriers and vapor barriers must be properly installed and sealed at all penetrations and seams. Should I Install a Vapor Barrier? A properly installed and sealed vapor barrier may decrease air and moisture infiltration into your rooms and make your home more energy efficient. If you live in Des Moines, the answer is probably NO, based on current building science consensus (2012). The reasoning behind this recommendation is as follows. In mixed climates with cold winters and hot humid summers, a wall must respond differently to moisture and temperature based on the season. A vapor barrier reduces the “flexibility” of the wall system to allow water vapor to escape without condensing. If you have any questions, you should consult a knowledgeable building professional. If you are working with an existing frame wall or masonry veneer wall, there are additional considerations you should think through before deciding one way or another. Water condenses on the warm side of a barrier. There is sometimes a concern in regards to installing a vapor barrier with a masonry veneer wall. This concern is related to the situation where, on a sunny day, water that is trapped in the brick may have a tendency to migrate into the wall system. When this water vapor contacts the vapor barrier (and the house is air conditioned – cool), it may have a tendency to condense and potentially collect in the wall system. If you are concerned about moisture condensing in a frame wall with a masonry veneer, there are three potential solutions. Don’t install the vapor barrier. This will allow moisture to continue to migrate through the wall system without getting “trapped” at any one point. Downside is that this solution is not as thermally efficient. Increase the air space at the brick veneer. Additional air space (say 2″ instead of 1″) will allow for more air flow up and out of the wall cavity, lessening the potential for water vapor to be stuck in the system. Current masonry standards call for an increased air space anyways. The downside is that if you are building a new foundation, the width may have to be increased for the additional air space. Expanded foam insulation. 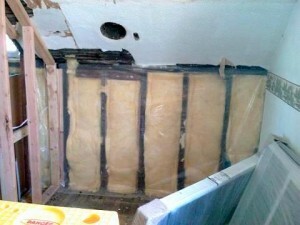 The closed cell expanded foam insulations are also vapor barriers. Water will not migrate into or through the insulation, so you don’t have to worry about condensation at the interior wall surface. Downside is that it may be more expensive than standard fiberglass batt or blown-in cellulose insulation. A properly installed polyethylene vapor barrier can create a very “tight” building envelope with little air infiltration. While this is great for energy efficiency, it then becomes important consider interior air quality. Particularly in situations where appliances, utilities, and fireplaces may be powered by natural gas, maintaining an adequate fresh air supply is critical to a healthy internal environment. A tightly sealed home requires mechanical venting and make-up air supply to maintain healthy internal air quality.